Over the course of this month we have been pondering this question: What is God’s dream for my life? For my family? For our church? For our world? As a hopeless idealist, dreams come second nature to me as I consider frequently dreams for our church and especially the children and families of Belle Meade. One of our greatest dreams in the children’s ministry is that our kids would deeply know and understand that they are loved by Jesus, connected to God and gifted to lead and serve the church and the world. That they would see childhood not as a place to wait and learn so that one day they might be able to lead and serve. Instead they would know it is a time they are already gifted in amazing ways and called to serve God to create change in the church and the world. Our Family Christmas Eve service offered a glimpse of that dream becoming reality. We welcomed over 200 people from newborns to great grandparents. The joy in the space was personified by a continual hum of giggles and laughter throughout the worship service. 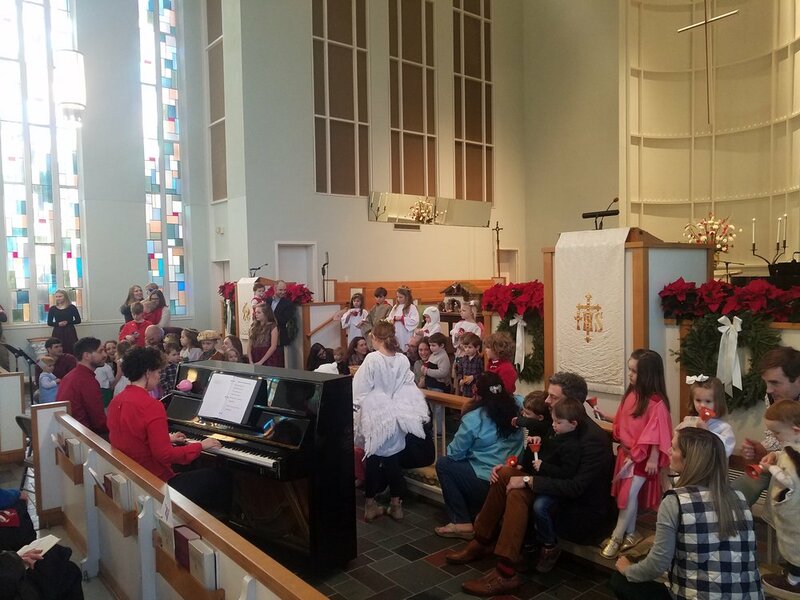 Children of all ages were invited to share their passion and gifts by playing the handbells, singing carols, acting out the nativity story, participating in voice and sign in the communion liturgy and testifying to the light of Christ with glow sticks and candles as we sang silent night. It was a place where our children could be fully themselves and celebrated for every wiggle, giggle, question, song and motion. It was a space where all were invited to share their gifts and energy, where even our youngest ones could lead our church in worship as we celebrated the birth of the Christ child. It was a place where dreams become reality. I have thought back to this service many times in recent weeks and found myself smiling with joy each time. I have remembered our 4th and 5th graders who assisted in leading the service by shepherding our youngest children and taking point on the liturgy. I have thought about the 3rd grader who asked me if she could move by one of our Kindergarten readers so she could help her with her line if she got stuck during the service. I have thought about the neighborhood visitor who shared that this was the first time she didn’t feel nervous having her 3 year old in worship because she knew it was a space where her child could be herself. I have remembered a moment where dreams were made real. On February 24th, our children will again have the chance to embrace their gifts and lead our people in worship. They are already eagerly working on creating prayers, liturgies, art pieces, music and the proclamation of the word. They are sharing their energy, ideas and hopes for what the worship service will look like on that day and the ways they will each get to lead and serve. They are dreaming of what it looks like to offer themselves, their gifts and their passion to minister to our congregation and our world. If there is one thing our children know how to do, it is to dream of greater things! My prayer is that we have the courage to dream with them. To see each worship service as a place where every person is invited to be fully themselves and offer their gifts. My dream is that we would open ourselves as a people to learn from and be led by our children. I hope you will make it a priority to be at worship on February 24th as our children offer their many wonderful gifts to lead us in worship!